I am constantly feeding hungry mouths. Well, that's not totally true. My kids all sleep through the night (from 7 or 8 pm until at least 6 am), though maybe that's not wise to declare. Such declarations in the past have led to children suddenly waking up in the middle of the night. Okay, let's start over. I am constantly feeding hungry mouths from 6 am until 8 pm. There. That works. 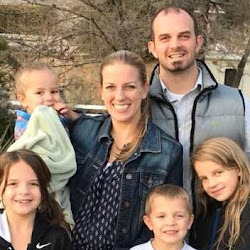 A husband, four kids, a dog, and four chickens. Oh, and currently 2 of the 25+ tadpoles we brought home last week that are still (somehow) alive. Do you know how much food we go through? And how many different preferences there are in this house? Let me just say, I'm a stickler about everyone eating the same dinner. I just feel it's respectful to whomever cooked (ahem, that'd be me), it gives the kids a good opportunity to try different things, get used to other items, or learn that sometimes we don't like the food we have, but if they don't eat they'll go to bed hungry. On rare occasions, we will eat something else if a new recipe I've tried totally bombs, but that's really not too often. However...other meals I am not so strict. Like at breakfast. I KNOW that everyone has their favorites. I do, too. And I want my family to be able to have a time in their day where what they eat is completely their choice. My husband, obviously, can eat whatever he wants, whenever he wants because he's an adult and my partner and it'd be completely ridiculous for me to ever dictate what/when he eats (out of courtesy to me, he always eats my dinners-just like everyone else). I'm not his mom. But the small people-yeah, I'm the boss of their food. For a long time, breakfast was oatmeal. That's it. Everyone likes it (at least a little), it's inexpensive, fast, and it's healthy. Since I have been waking up earlier to swim in the morning or get other things done, I've found myself with extra time before my husband leaves for work. I swiftly decided to use that time to make breakfast a time of choice. Now, this does mean that it takes me longer to prepare breakfast, I dirty way more dishes, and it costs us a little more, but everyone is getting to eat something of their choice which is exciting and important to me. It's a lot. I know it's a lot. And when I see how many pots and pans I've used I wonder if I'm being ridiculous. And, truthfully, maybe I am. But I've decided that it's a good ridiculous. It's a ridiculous that shows my family that I value their preferences, likes, and choices. It's a decision that teaches them that they are worthy of my time and efforts. 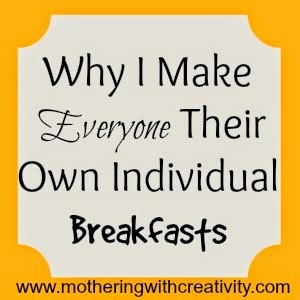 It's a choice that teaches my children to make decisions about what they'd like to eat. And it's a choice that makes for a more enjoyable breakfast time for everyone. This may not always be how breakfast in our house works, but for now, it's beautiful (and messy and time consuming). I also really need my chickens to grow up so I can get free eggs, but that's a whole different conversation. Do you have time during your day when your family members get to choose what they want to eat or do you all eat the same things at every meal/snack?